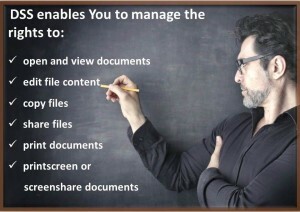 Thanks to the use of DSS user rights management, You can easily distribute and control document permissions. These options allow You to smoothen communciation between departments, avoid unnecessary staff misunderstandings and improve the level of data security. How does it work? With DSS You can implement individual rights, as well as group rights. This means each person within the company can work differently, according to the permissions they have. You can also create groups of users which may include an entire department and provide them, with a unique set of permissions. You decide wheather the Finanancial Department should have the right to edit, print and share documents or if the Client Service Department can screenshare their documents. There is also an option of giving everyone the same rights, however limiting the types of documents they can work on. These simple choices can greatly reduce the risk of simple mistakes in sharing information and prevent more serious issues, such as data leaks and corporate espionage. As You can see, there are numerous possibilites. DSS while being strict in security meansures, allows You to remain flexible when managing Your company.